The Cosmedic Room in Western Sydney offers affordable treatment with the world's state of the art medical lasers - the PicoSure Laser Workstation and Sculpsure Laser. 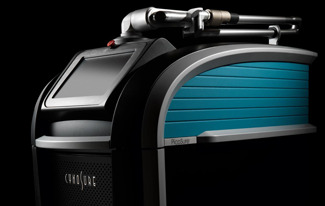 The PicoSure Laser is the first picosecond laser and introduced in mid 2013. The PicoSure represents a major advance in medical lasers. 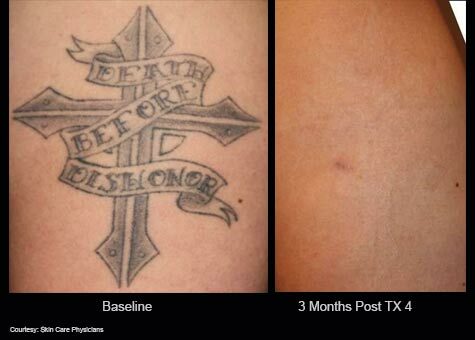 The PicoSure achieves tattoo removal in far fewer sessions and more completely than Q-Switched lasers. The unparalleled breakthrough in laser technology which is the Picosure Laser Workstation delivers ultra-short pulse bursts of energy to the skin measured in trillionths of a second. 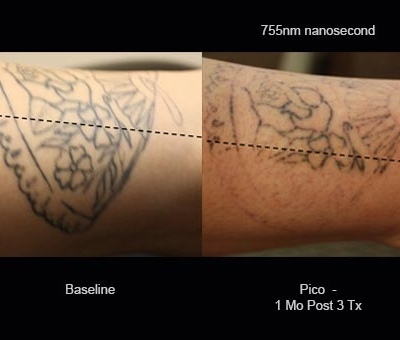 Picosecond pulse width is 100X shorter than nanosecond (Q-switched) laser technology, enabling unmatched photomechanical impact for better clearance of tattoos with fewer treatments, less fluence (laser energy) and without injury to the surrounding skin. Even dark, stubborn blue and green inks, as well as previously-treated recalcitrant tattoos can be removed. The Picosure Laser Workstation delivers laser pulses measured in picosecond pulse widths which is 100X shorter than nanosecond (Q-switched) technology. Only ultra-short pulse durations trigger a photomechanical effect which breaks up tattoo pigment. With this short pulse width, half the fluence (laser energy) is required to breakup tattoo pigment compared to Q-switched nanosecond lasers. With the Picosure Laser Workstation your skin is spared the heat damaging effect of Q-switched lasers. Who is tattoo removal for? If you are happy and satisfied with your tattoo then we are not for you. At The Cosmedic Room we are not attempting to convince anyone to get their tattoo removed. We provide a service to those who wish to get a tattoo removed either because they want a different one or simply to be rid of one. If you wish to alter a tattoo then we will work with your tattoo artist's specific instructions to effect this. If you have "colour bleed" from your tattoo into the surrounding skin and wish to have this treated then at The Cosmedic Room we can help to lighten the "bleed". 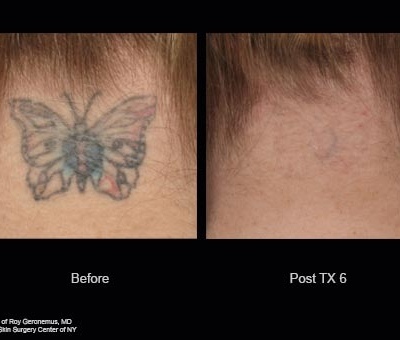 Why choose The Cosmedic Room for your tattoo removal? The Picosure™ Laser manufacture by Cynosure is the first major advance in medical lasers in 20 years. Until the advent of the Picosure, lasers for tattoo removal were Q-switched lasers with their laser pulses lasting nanoseconds. The major advance of the Picosure is the much shorter laser pulse width lasting picoseconds (trillionths of a second). The picosecond pulses of laser light energy from the Picosure™ remove tattoos with less treatments, more effectively and with less discomfort than the previous lasers using Q-switched technology. 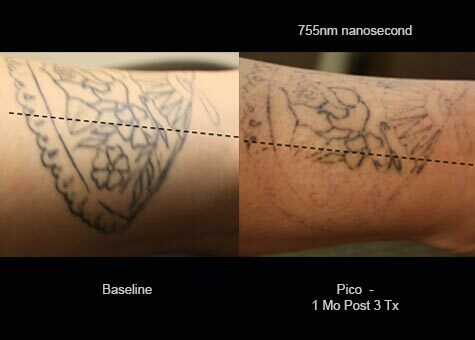 The Picosure™ delivers ultra short burst of laser light energy at a wavelength which is absorbed by tattoo pigment. The molecules of tattoo ink are shattered and disrupted by a photomechanical effect and are carried away by the body's immune system. This shattering by the Picosure™ laser produces far smaller particles than the older laser technology. In turn, this results in far quicker clearing of the tattoo. This means less treatments! 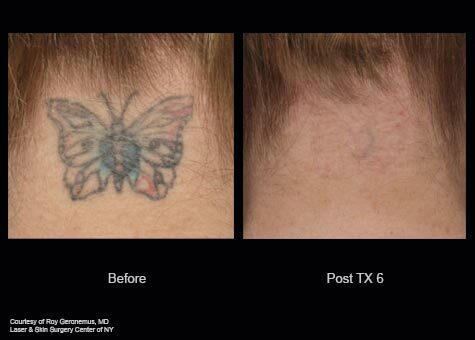 Some things to consider about laser tattoo removal. People with darker skin types have to be treated more conservatively than light coloured skin types. Those with darker skin will require more treatments to remove their tattoo. Tattoos on the head and neck and trunk require less sessions than on hands, arms and legs. Black tattoos are the quickest to remove and require less sessions. Lighter colours require more work. The tattoo density of your tattoo influences how much work will be needed to remove it. The more the density of ink, the more work to remove it. The tattoo artist may have layered one colour on top of another or you may have a newer tattoo layered over an older one. These factors may also result in more work being required. Large tattoos will require more work. A tattoo completely encircling a limb must be treated in stages so that the treatment during one session does not completely encircle the limb. This depends on a number of things and it is difficult to tell without seeing you, your skin type and your tattoo. There has to be 6 weeks between treatments. The number of treatments depends on a number of factors including skin type, colours used in the tattoo, location of the tattoo, depth and intensity of inking etc. If you have a darker skin type (higher Fitzpatrick Skin Type score) the intensity of the laser must be set lower as your own melanin (skin pigment) will also absorb the laser light. Also, some pigments (for example iron oxide) are more resistant to removal. It is usually not possible to tell what tattoo pigments have been used. Some weeks after your first treatment there will be noticeable fading of the tattoo. Some colours will clear quicker than others. It is recommended that treatments with the PicoSure™ laser be no more frequent than 6 weeks apart. (see heading below for explanation for this). 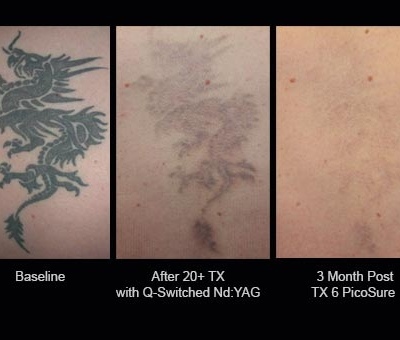 Is tattoo removal with the Picosure more expensive than with the older laser technologies? 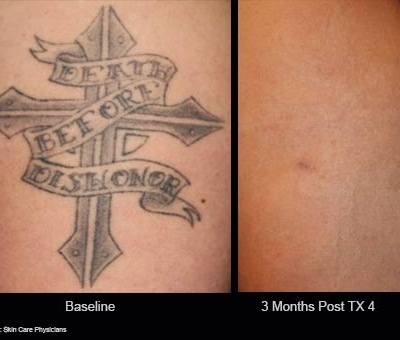 With the Picosure laser™, tattoos are removed more quickly than with other lasers. You will require less treatments. 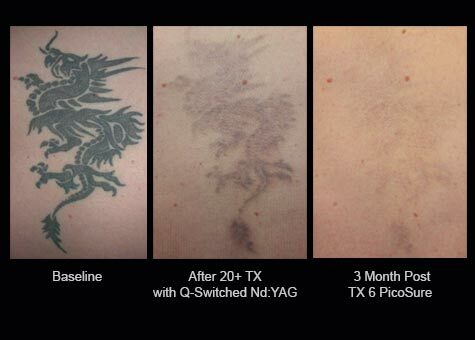 Typically, you pay by the session when getting a tattoo removal with Q-switched lasers. Depending on tattoo colours, you may require up to 20 treatments. Even though treatments with the Picosure™ laser may be more expensive per treatment, the fact that you will require less treatments means that the total cost will be similar to other technologies. 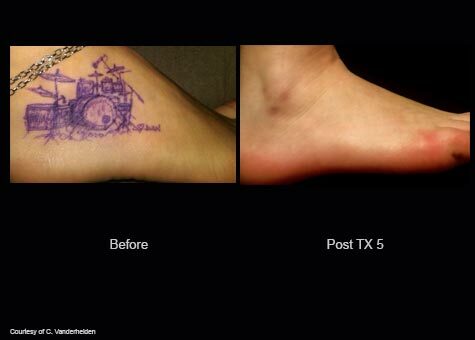 Additionally, at The Cosmedic Room we provide a written quote for the total cost of removing your tattoo. This means that you will know the maximum which you will pay. Typically, we divide the total cost over an initial number of treatments. Once that the agreed amount has been paid then you pay no more and keep having treatments until you are satisfied with the degree of removal. When you got your tattoo it was not a discomfort-free experience. 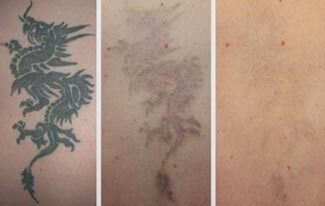 Using the Picosure laser is similar in discomfort level to getting your tattoo but the sensation is different. Most describe the sensation to be like a rubber band flicking against the skin or like static electricity hitting the skin. At The Cosmedic Room we use extremely cold air from a Zimmer Cryo 6 blower to cool and numb the area to be treated. This means that the discomfort of tattoo removal is markedly diminished. Those who have had tattoo removal sessions with Q-switched lasers (previous tattoo removal technology) say that treatment at The Cosmedic Room with the Picosure laser is a very pleasant experience by comparison. Who can't be treated with the Picosure laser? Anyone who has ever had therapy with gold (as used in the treatment of some types of arthritis) cannot be treated. Cosmetic tattoos need to be treated with caution and careful prior discussion. We have successfully removed badly done eyebrow tattoos. We do a "test shot" on a small area initially. How long will it take to remove my tattoo? How many treatments are required? It is difficult to tell without seeing you, your skin type and your tattoo. There has to be 6 weeks between treatments. The number of treatments depends on a number of factors including skin type, colours used in the tattoo, location of the tattoo etc. 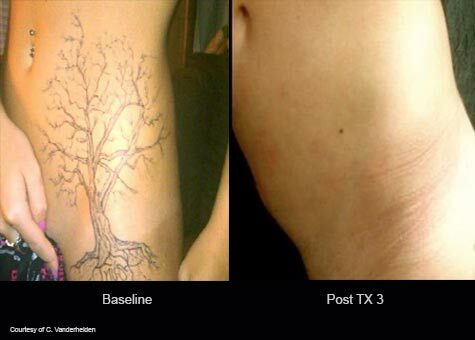 After your first treatment there will be some noticeable fading especially of finer lines. There will be more fading in the interval between treatments. By the third treatment there will be very noticeable fading and removal of some areas of the tattoo. Some colours will clear quicker than others. More densely inked areas and some inks will move more quickly. What happens when I come to The Cosmedic Room for tattoo removal? Initially, you will be asked to complete some forms regarding your medical history, skin typing and consent forms. This will take about 15 minutes. You will then have a consultation with a doctor. Tattoo removal procedures will be explained and advice given. Pricing options will be discussed. Side effects and likely outcomes will be addressed. 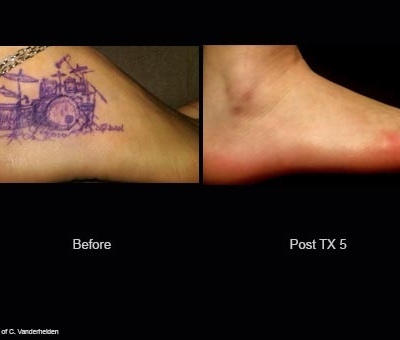 The actual time taken for the tattoo treatment varies by the size of tattoo. Simple tattoos comprising of lines take only minutes per treatment. Large complex tattoos take up to 30 minutes or even longer. After your treatment we will continue to cool the area with very cold air for a few minutes. The most important thing to consider when you are having any sort of laser treatment. More important than price is safety, quality, professional standards and medical competence. Ask who will perform your procedure. Do they know what they are doing? What is their experience? Are they aware of laser safety? Some websites even omit to provide the names and qualifications of the providers! After your treatment we provide a printed sheet with very comprehensive advice on how to care for your skin after laser treatment. Additionally, there is list of what to expect straight after your tattoo removal treatment and in the weeks afterwards. We provide an after hours number for you to call at any time if you have any concerns or queries.